Integrating iMindMap software into your daily routine allows you to streamline your workload, save time and condense and organise vast quantities of information, all whilst boosting your productivity. Here are just eight ways that iMindMap can be utilised to help you get ahead at work. iMindMap’s Brainstorm View* provides you with a digital thinking space where you can capture ideas easily using coloured sticky-notes on the infinite cork-board canvas. 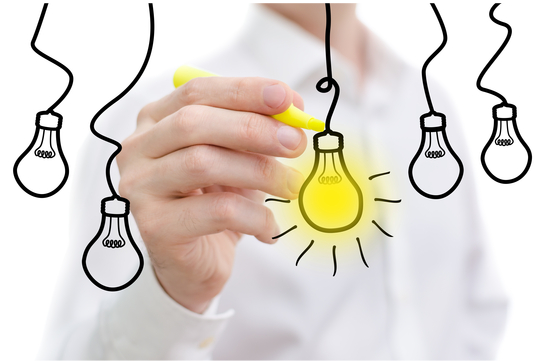 You can let your ideas flow without having to worry about organisation or structure. When you are ready to start sharing your ideas with the group, switch to Mind Map View and watch your ideas take on the structure of a Mind Map. From here you can organise and refine your ideas, so they are ready to share with your colleagues. iMindMap gives you the perfect platform to plan and deliver presentations with style and leave a lasting impact on your audience. 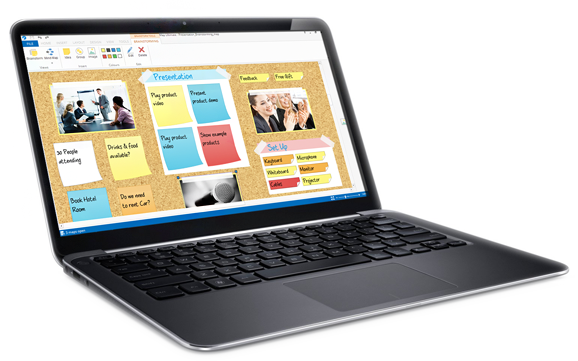 iMindMap’s Presentation View* allows you to put your Mind Maps in 3D, completely customise the effects of your presentation and attach files, webpages and audio to your Mind Map, all of which can be easily manipulated whilst you speak. Using iMindMap for your presentations means a more engrossing and visually stimulating experience for both you and your audience. It will help you avoid having your head stuck in pages of notes, and instead you will have the freedom to engage and wow your audience. Impress your audience further by adding your company logo to the presentation and choose from a variety of new backgrounds. Save yourself time by using a presentation template and provide your audience with handouts by exporting your presentations to PDF form. 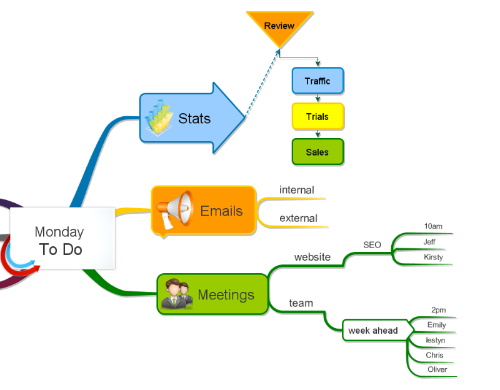 Plan your workload, schedules, meetings and proposals in a more productive and time effective way with iMindMap. You can divide up your topics and tasks into different branches and draw clean, clear connections so you can see how different projects will impact on one another. Use the Branch Art feature to visually represent your ideas. You can even save your Mind Maps as templates, so the next time you need to plan your day, week, meeting or event, your Mind Map will be ready for you to amend. Find out more. iMindMap provides you with an infinite space for radiant thinking. You can consolidate an entire year or more’s worth of information in just one map. iMindMap includes clever organisational features such as the ability to Expand and Collapse branches, so your Mind Map will never look cluttered. There is also the capacity to link any related documents, webpages or other files directly to a branch of the Mind Map, meaning you can create an easy-to-navigate library of information, all on one screen. By creating a Mind Map, you can view all the elements of a problem at once, stimulating association and integration, and encouraging your brain to form solutions that would normally remain untapped at the edge of your thinking. iMindMap gives you complete freedom to manipulate and draw connections between your ideas, without interrupting your trail of thought. 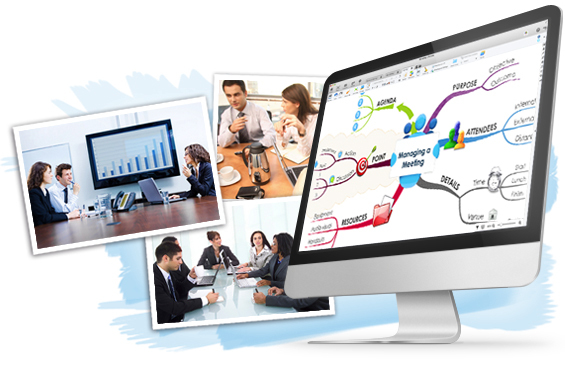 iMindMap allows you to harness the creative input of all members of a group to create plans and implement projects. iMindMap has made it even easier for you to search for your Mind Maps and connect with other users with the new Maps and Contacts tabs at the top of the screen. Contributions can be added to the relevant branches and then explored further, or put on hold for a later discussion. Go a step further and save and share your maps to the cloud, using iMindMap Cloud and Mobile. iMindMap’s Audio Notes feature will allow you to record your meetings and ensure that no comment is missed, without the momentum of the discussion being lost. iMindMap is the perfect tool for business analysis and comes equipped with templates for Goal Setting, Performance Coaching, PESTLE Analysis, SWOT Analysis and Force Field Analysis. Any business model that you wish to explore can be simplified and enhanced by using iMindMap as your canvas. You can then link all of these to a monthly or annual iMindMap and they can be accessed at a moment’s notice. iMindMap allows you to collaborate with visual task management application, DropTask*. You can export your iMindMaps to DropTask to create tasks or whole projects that will make your planning and implementing a whole lot easier. DropTask helps you to keep on top of your workload, allowing you to easily update others on your progress on the tasks for the week. *Only available in iMindMap 8 Ultimate. Click here to download the iMindMap 7 day free trial.